This book is about Jacobus (Jacob) (Jaap) Groenewoud, a skinny, frail young man with bad eyesight and thick glasses, born into a working-class family in Amsterdam. An intelligent and adventurous young man, who at the age of 21 years decides to go to South Africa hoping to find fame and fortune. Even though Jacob Groenewoud is discharged from Military Services and exempt from Military Duties indefinitely, he volunteers for military duties a few times. Although initially rejected, he becomes part of the ‘Springbokken’ Brigade and becomes a ‘special soldier’. 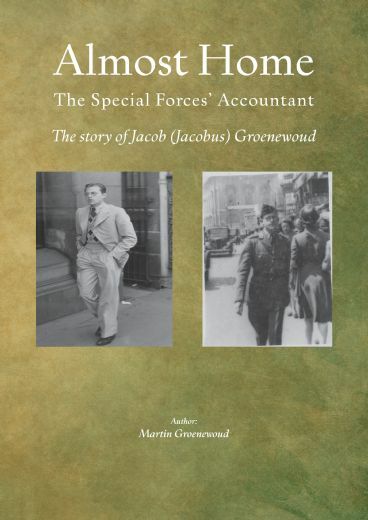 He becomes one of the four Dutch Officers that are selected for project ‘Jedburgh’. Leading Jedburgh Team ‘Claude’, consisting of Capt. Jacobus Groenewoud, Lt. Harvey Allan Todd and Sgt. Carl Alden Scott, he participates in the Battle of Arnhem and Operation Market Garden. During the Battle of Arnhem both Jacob and Lt. Harvey Allan Todd are constantly in the leading forces. And with the assistance of a small patrol Jacob manages to capture the Head Quarters of the local German Area Commander. During this raid, he discovers German plans for the destruction of both the Rotterdam and the Amsterdam harbor. By discovering these plans, the Dutch authorities are able to prevent the destruction of these harbors. When some of the Armed Forces are disconnected from the Main Force and Division HQ, Jacob volunteers to re-establish contact. During this attempt, Jacob Groenewoud is killed by a German sniper. Jacob is buried at the Airborne War Cemetery in Oosterbeek. This book is based on hundreds of original documents, letters and photos, in possession of the Groenewoud family and tells the story of Jacob and his family. And how this frail, skinny, young man, who looked like an accountant, became a war hero. A war hero, whose name marks the spot called the ‘Jacob Groenewoud Plantsoen’ (Jacob Groenewoud Park) close to the John Frost Bridge in Arhem. A spot where some of the most severe fighting took place during the Battle of Arnhem and Operation Market Garden. This book is about an unknown ordinary family living in the Netherlands and about an unknown young man that became a ‘somebody’. Somebody who died fighting for the freedom of his country, the Netherlands. A young man whose legacy and memory should be preserved. Amsterdam, the Netherlands, Wednesday November 8th, 1916. With a moderate Southern western wind, a mere 9 degrees Celsius and a little drizzle, it feels very cold. But despite the cold, the Groenewoud ‘homestead’, that little apartment located in the ‘Madurastraat’ (Madurastreet), is filled with ‘rays of sunshine’ and is warm and cozy. The apartment is filled with party decorations and party balloons. The almost two-year-old Hendrik Dirk Johannes, known as Henk, who was born on Sunday, November 29th, 1914 stands by the window and is watching the street below. It won’t be long before Mam and Dad will be coming home. They will be bringing home a new baby. Henk is wondering whether they will bring back home, a new baby brother or a new baby sister. When he sees his father and mother coming around the corner pushing a pram, he jumps up-and-down with excitement. As he hears Mam and Dad carrying the pram up the steep small steps, to the third floor, of the ‘Madurastraat 130’ (Madurastreet 130), he rushes to the front door. He can hardly wait for Mam and Dad to come in. And there it is, a new born baby. He can’t wait to see what is in the pram, under all these blankets. It is a little baby brother. His new brother is called Jacobus Jr. Although named Jacobus, after his father, his parents call this lively little boy, Jaap or Jimmy and sometimes Jacob. Martin Groenewoud, geboren in Amsterdam op 22 december 1954, is een volle neef van Jacob Groenewoud. Hij gaat naar de ‘Vrije Universiteit’ in Amsterdam met als doel om leraar wiskunde te worden. Hij belandt echter in 1978 in de IT-industrie en is werkzaam bij een van de Nederlandse grote banken, om vervolgens in 1989 in dienst te treden bij IBM. Gedurende meer dan 26 jaar vervult hij binnen IBM diverse internationale functies en diverse managementfuncties. Na zijn (vervroegde) pensionering in 2015 houdt Martin zich voornamelijk bezig met schrijven, beeldhouwen, houtbewerken, tekenen, schilderen en lezen. Daarnaast speelt hij regelmatig een rondje golf. Martin woont in Ouderkerk aan de Amstel met zijn vrouw Jeannette, zijn zoon Dennis en dochter Ronesca. Daarnaast brengt het gezin ook veel tijd door in hun tweede huis in Sechelt, British Columbia, Canada.